Meijer Weekly coupon Matchup Sunday 10/16-10/22 or Thursday 10/20-10/26/16! Will count towards the personalized rewards! Good Pries on True Goodness items! 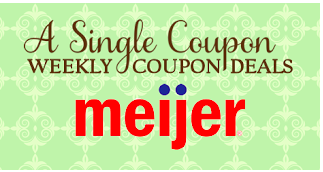 Good price on Meijer brand vegetables! Buy $25 in Huggies diapers, wipes, Pull Ups or Goodnite and get $5 catalina. Buy 3 Enfamil or Gerber or Similac powder formula and get $10 catalina. Buy $10 or more in certain Gerber or Meijer items and get $3 catalina.